Now Creative - Case Study - Scotia Golfing. 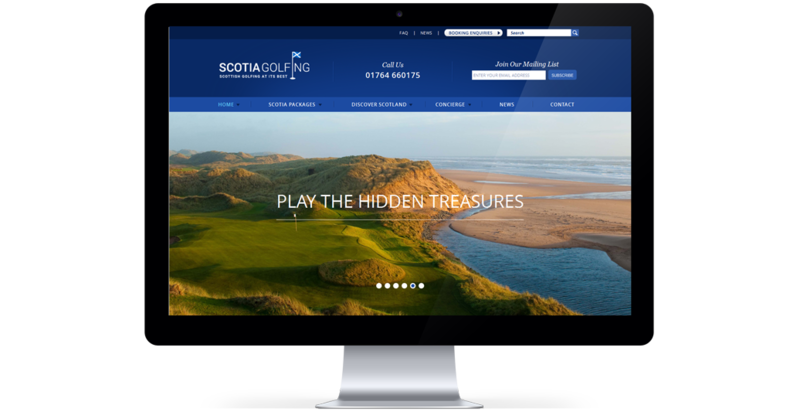 Brand Creation & Website Design showcasing the very best golfing experiences in scotland. Scotland is The Ultimate Golfing Destination and Scotia Golfing will ensure a Scottish golf vacation that is truly memorable. From a base in beautiful Perthshire, they specialise in providing clients with The Ultimate Golf Vacation in Scotland. Branding that is undeniably scottish with a strong aspect of golf in its make-up. A trusted tourism resource employing lots of wonderful, awe inspiring scenic photos of what scottish golf has to offer and providing the customer with the best in golfing experiences. Variable weight combination, block typeface. Colours used reflected the scottish influence; Dark Navy, Sky Blue, White. The flag is used as both an obvious visual golf tie-in, and a further reference to scotland.